If you were really standing at my door right now, I’d swing it open and welcome you in with a hug and then you’d be immediately trampled by two dogs wanting to kiss you. I’m not gonna lie, it’s pretty crazy whenever someone comes to the door. There would be a huge commotion. You can see our Labradoodle, Lily, standing on the stairs in the top pic (muddy feet and all) just like she would if she saw you ring the doorbell. She’d be there for just a split second and then she’d be down by the door wanting to kiss your face. Jack (our Goldendoodle) would be scrambling around the corner to make it to you before Lily got there, leaping in the air and skidding around on the wood floors trying to grab a toy or eat or something to calm himself down. He would be ridiculously excited to see you (sorry, we are still working on his manners and anxiety issues heheh). But once we got past all the excitement and fur flying, you’d finally feel that it was possible to come all the way inside. :) So, welcome. Everything about Fall makes me happy. I mean, no explanation of my love for Fall needed after all these years, right? We live near Seattle on a peninsula out in the Puget Sound. Even though I don’t look forward to the gray rainy days of winter you might associate with Seattle, in general Fall is absolutely FANTASTIC here. Be jealous. It’s not hot or cold or gray (at least not now ha!). The NW has some nice weather this time of year! I bring out the umbrellas just for fun, but the weather is just about perfect for much of September (and if we are lucky, it will probably be beautiful in October too!) I actually look forward to September and October all year round. Autumn is my favorite. And to be honest, the gray rainy days are perfect for snuggling inside and nesting inside, so I’m even cool with those kinds of days now and then. While I love Fall, I’m not as crafty as some of the talented ladies in blogland, so by comparison my Fall decor is pretty subtle. I’m just not that into themed seasonal decor, but I do love to make my home more cozy this time of year! That’s my thing and cozy is what Fall is all about around my house. I bring out the blankets, pillows, rugs, candles, layers, textures, plants, and I even switch around books for the season! The feeling of the house starts to evolve as little things change. I just keep on adding the layers until it feels warmer and cozier! I snipped Fall branches right off a tree in our yard for my mantel. I just love the simplicity of a bit of natural decor all year round, but especially in the Fall. Creating the mood and ambience for the season is one of the many joys of my life :). Soon I’ll be lighting the fire and spending the cooler nights curled up on a chair by the fireplace, or nestled up on a sofa with my coffee. To me, Fall is about comforts and making our home our sanctuary and refuge from the world. My girls and I have fun setting tables and lighting candles (I’d say candles are probably my most favorite decor between now and spring!). While I don’t feel like I have to use “fall colors,” I do kind of love bringing in some reds, oranges and greens in small doses. Those colors always put me in a cozy and festive mood. That’s one of the things I love most about my simple neutral palette, I can pretty much bring in any color for any season and it works! I also love Fall because I start to get more motivated to cook and bake, so you’ll find me in this corner a lot more often! I love when my house smells like freshly baked pumpkin cookies! This is the time of the year when we get back into our rhythms, when my son returns to school and all his Fall routines become a part of our days. Our hall “command center” board is where we keep all the important papers and things I need to keep track of everything this time of year! Being a little more organized is definitely part of Fall nesting. I also love creating a comfy little nest in my room in the Fall! A few more cozy pillows and blankets and fluffy comforters make their way to our bed. I meant my fluffy feather comforters, but these two think they are THE official fluffy comforters and should be allowed up here to keep us warm. I try to keep them off, but I’m outnumbered. And, their faces kill me. Speaking of adding extra pillows and blankets, I was asked on Instagram over the weekend where I keep all my regular bed pillows when I make my bed in the morning! Great question. This lidded basket (pictured above) is where they go! It keeps them clean and off the floor. The decorative ones can go back in the basket at the end of the day or some pile on top (or on the settee which isn’t pictured). It’s an easy system! The basket is from Birch Lane. (the art is from Between You and Me on Etsy). Want to see our coziest Fall hangout at home? This is our upstairs TV/media room. It’s the only room in the house where we have a TV! It’s not a very big room, so the sectional (LaZ Boy) makes it really warm and comfortable in the Fall, especially as the nights start to get cooler! I don’t get to watch a lot of TV (book writing takes up a lot of my free time!) but we do try to watch something together every week as a family, so it’s really nice to have this space. Thanks for coming by for a peek at what’s going on around my house! 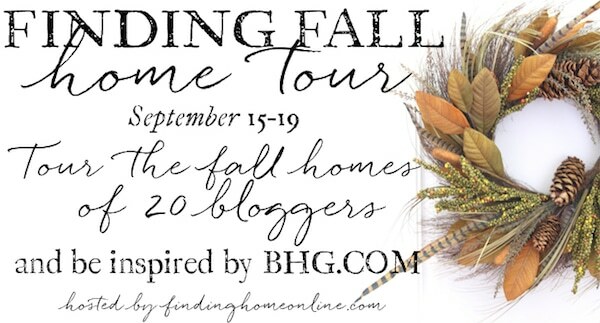 Every day is Fall nesting around here (and soon I’ll be starting my 21 Days of Loving Fall series) so I hope you’ll hang out and be inspired all season long! Meanwhile, to start at the beginning of the home tours and find the links in order, you can visit Laura at Finding Home and then the next up on the tour is Thistlewood Farms! 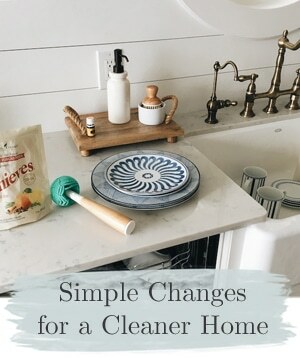 And here are a couple of fun links, check out Better Homes & Gardens 100 Days of Holidays and be sure to follow the the BHG Finding Fall Home Tour Pinterest Board! Enjoy the rest of the Fall tours! 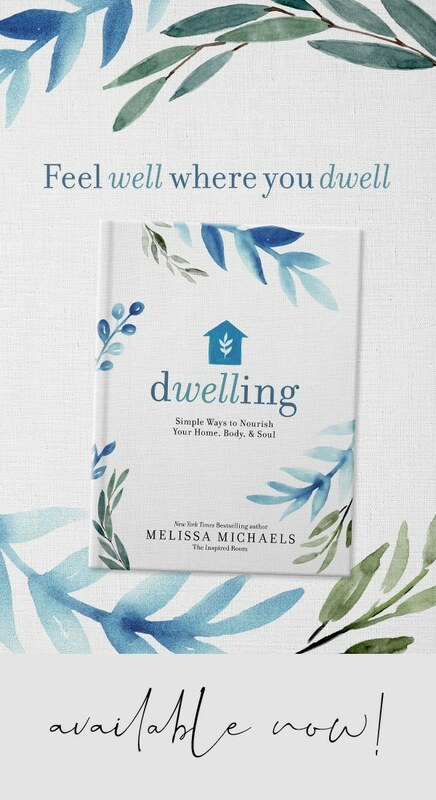 Melissa – your home and words are beautiful. Thank you so much for being part of the tour. You started us out beautifully. Melissa! This looks gorgeous. Your dining room table is perfection and I’m totally loving your mantel. What a beautiful home! 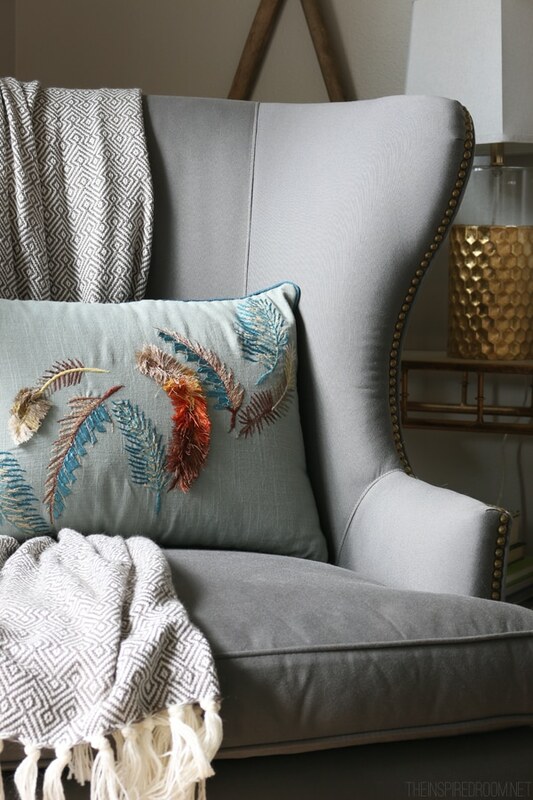 Your home is beautiful with it’s nod to fall, Melissa! I love your subtle touches that are cozy and homey! Such a beautiful home – any season! Thanks for the tour and for letting us see more of those cute doggies. I have a golden retriever so I understand the meet and greet craziness every time someone comes to visit! My favorite photo HAS to be the dogs on the bed. 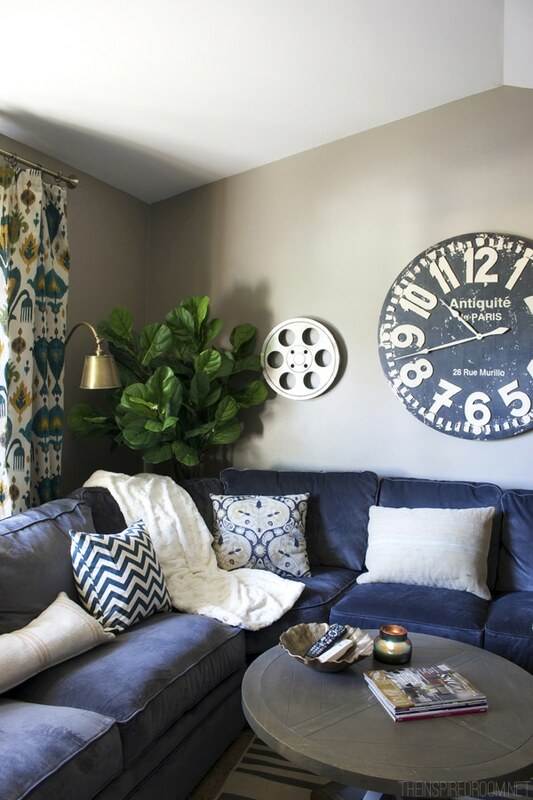 Coming in at a close 2nd + 3rd would be photos of your blue sectional (want one!) 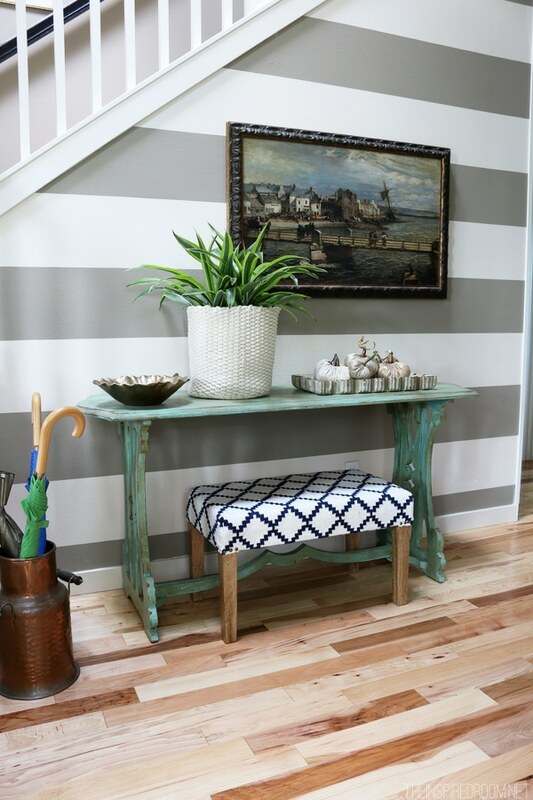 + that cute blue + white upholstered bench at your entry. Doesn’t that pattern remind you of an old Irish Chain quilt? I know you told us, but please tell me where your kitchen sconce was purchased. I know it has to be one of my online crush companies but don’t know which. TY, in advance! Thank you! Restoration Hardware :-) It was charming and so reasonable (I think it was on sale too when I bought it)! Restoration Hardware has the BEST light fixtures, + some of them are NOT that expensive, either! TY! I love your home. It looks amazing – light and airy, but still comfortable and cozy. Thank you! I got it from the LoveFeast Shop http://www.lovefeastshop.com/. I LOVE it. I have used it all year round and you are so right, it’s perfect for a seasonal vignette! It is made from the top of a wine barrel, you can see the detail more closely where I featured it in a giveaway last year https://theinspiredroom.net/2013/11/26/thanks-giveaway-lovefeast-table/! I like your subtle approach to Fall decor. My autumnal decor inside matches what Fall looks like outside of my home. I pluck branches, berries, leaves from my yard. I do not use slave labor made (aka China) items, what God blesses me with in central VA is sooo much better . I LOVE that. YES YES YES. God does such a lovely job of inspiring us! You do Fall well…pinning this for so many reasons…. Creating a home…thanks for the inspiration. Your home is beautiful! And your dogs are ADORABLE!! Thanks for sharing! Love, love, love your blue!!! Can I move in? Would not change a thing! Navy and neutrals have always been my go-to colors and moving my house back to them. When we moved to this house 10 years ago, I unfortunately got caught up in reds and golds! Over it! 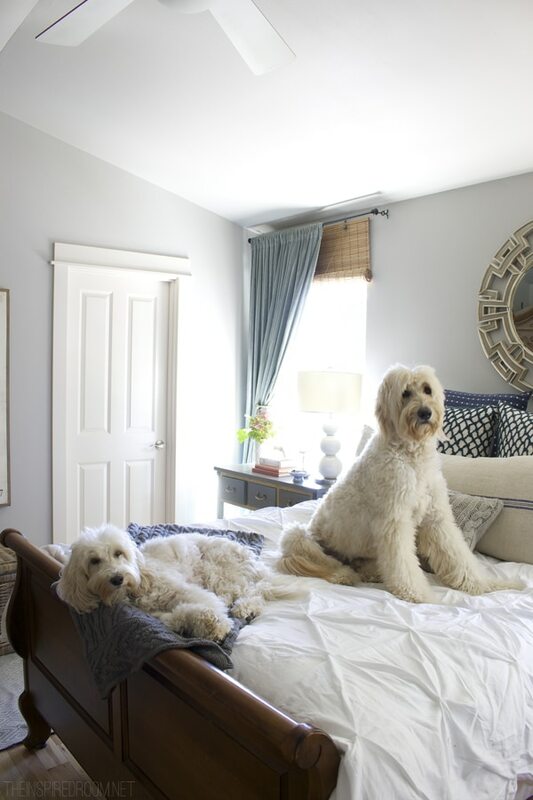 Love the dogs on the white comforter! Here, too! What a beautiful home and talents for making it so you are blessed with! I must look at your summer decor next! Our daughter and son in law lived on Whidby Island about 10 years ago and it is wonderful there on Puget Sound. Thanks for sharing you home with us. 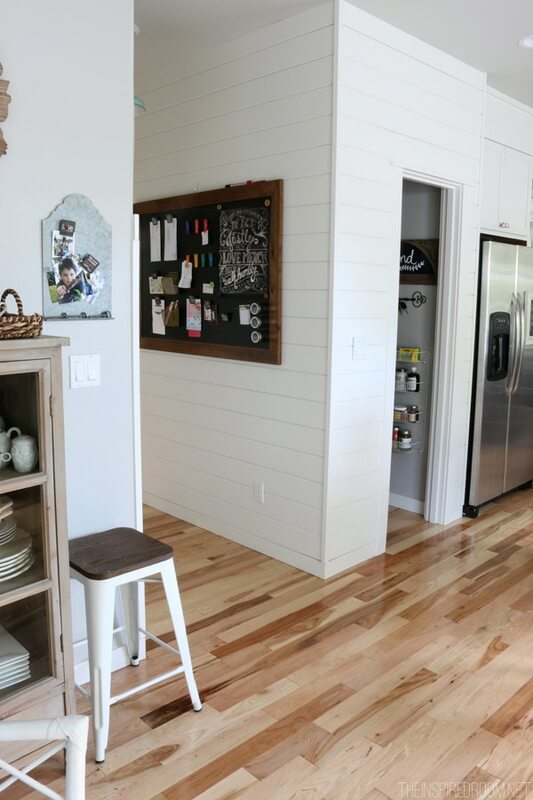 Love the horizontal “siding” in pic #11(pantry area). Would love to know more… did you install it ? What is it made of? 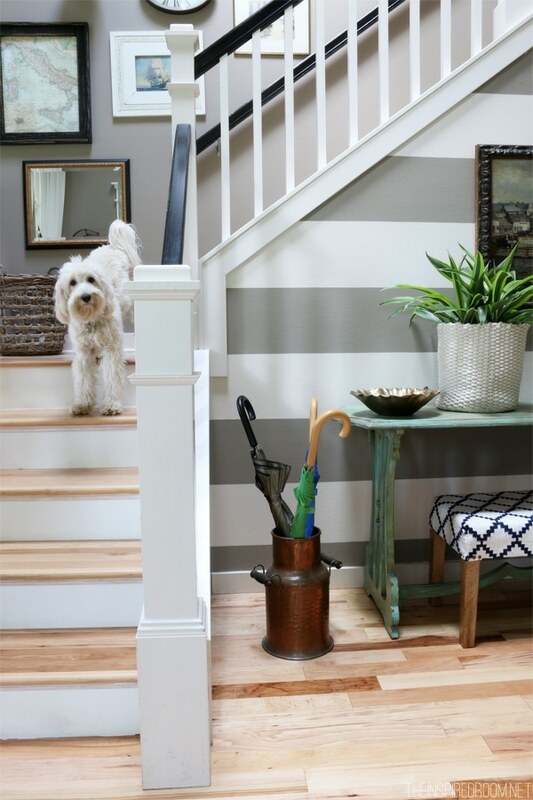 Super cute idea for my hallway… much easier to clean the dog slobber from Kong chasing down the hall. Please share! I like the fact that you are not into seasonal themed decor. I love the subtle hints a room can convey. Your rooms are lovely. Love your living, fluffy comforters on your bed! :) I had to laugh at your description of what happens when the doorbell rings. It’s pretty much the same here! 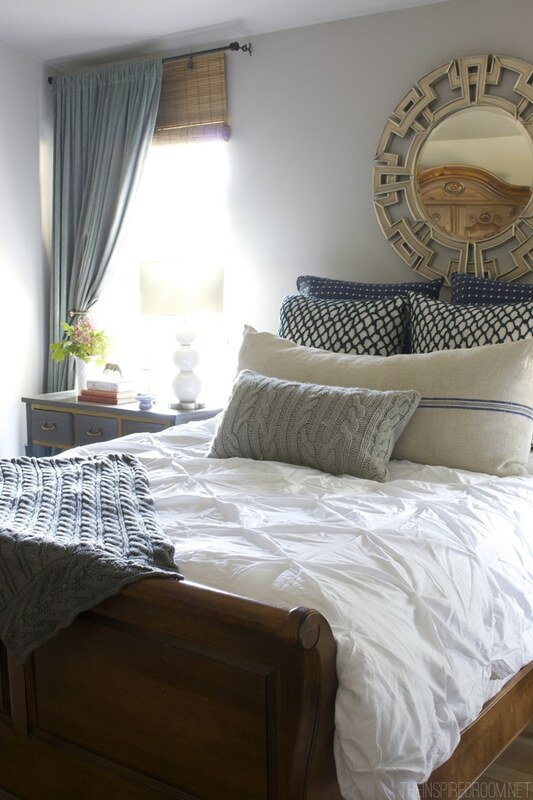 I could just curl up with some of those comfy throws that you have all about your home. Thank you for the tour! Fall is definitely my favorite season, and I love making my home cozier, too. My sister and her family live in Seattle. I’m with you on the cold, overcast days – I don’t mind curling up on the couch with a blanket and a good book, but I know it’s hard when my niece and nephew don’t get to go outside. The amazing summer-into-fall months make up for it, though! 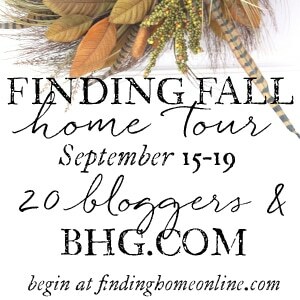 Looking forward to your 21 Days of Loving Fall series! I agree. Love love love your home. So cozy and inviting. You have a warm and lovely home. The floors are to die for. And I love those sweet doggy faces too. My two Yorkies sleep with me. And we sleep blissfully. I just caught a glimpse of your kitchen island. Where did you get it? Or did you build it? I’m so tired of my builder grade island. Must change it. Thank you for the inspiration ! Almost ready to do the Fall makeover at my house but it’s 85 degrees outside so I’m waiting just a little bit longer. Your home is so lovely & comfortable. And…thanks for sharing your ‘Doodles with us. My Goldendoodle, Stitch, looks exactly like Jack, but my Labradoodle, Buddy, swam around the poodle end of the gene pool a bit longer. My boys also act like morons when someone comes to the door. Thanks again for sharing! Haha, that’s funny. They are ridiculous. Thanks Lee! Just visited for the first time and so enjoyed your tour and beautiful, peaceful home, especially all the pretty table centerpieces. Thank you! Also, I have the exact same curtains shown in the tv room behind the sectional and love that unique color combination so much. Melissa, your home is beautiful, every inch of it looks cozy and comfortable. Very inspiring. So inviting, Melissa. Love your subtle touches. Happy fall! Hi there! Love the mirror over your fireplace. Restoration hardware? Your doodles are adorable as well. We are contemplating adding one to our family and wonder if you got them locally? Yes, the mirror is Restoration Hardware. The pups are local :-). Jack is from Big Oak Ranch in Newberg, Oregon and Lily is from Seattle Labradoodles. Both are wonderful dogs! 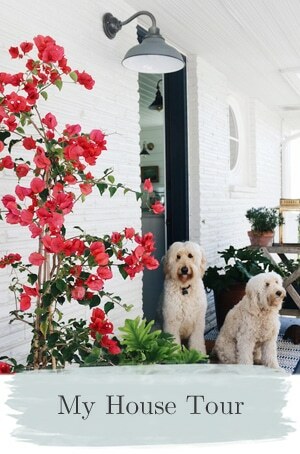 Love seeing your beautiful home…including your dogs!!! We also have a Goldendoodle…Little Mrs Mavis…Thank you for inspiring…so lovely! I think I just swooned a little bit. lol I want to curl up with a book and hot cocoa, and relax in your home. You have done such a beautiful work making your home gorgeous, yet welcoming. :) Thank you for the tour. Come on over :-) Thanks so much!! Thanks for giving us a tour Melissa! Your home looks so lovely and cozy. I love all the layers and textures you’ve added…..especially those two fluffy “comforters” of yours. Do they use that little mirror on the stair landing to check their faces before they greet guests at the door? Hahaha, yes, that’s probably why I find their dog noses on it sometimes! Heheh. Yes, the drapes came from World Market! Melissa your home is always so cozy and welcoming, but the Fall touches really make me smile. I love that your blankies are always at the ready, I just washed all of mine so they’re extra fluffy and ready for those wonderfully cool nights. unless of course you can enlist a puppy to lay on your feet, which is always good. thanks for sharing! You have a beautiful home! Can you tell me where you found the mirror you have hanging over your mantel? I love the shape and frame color. Love how pretty everything looks! 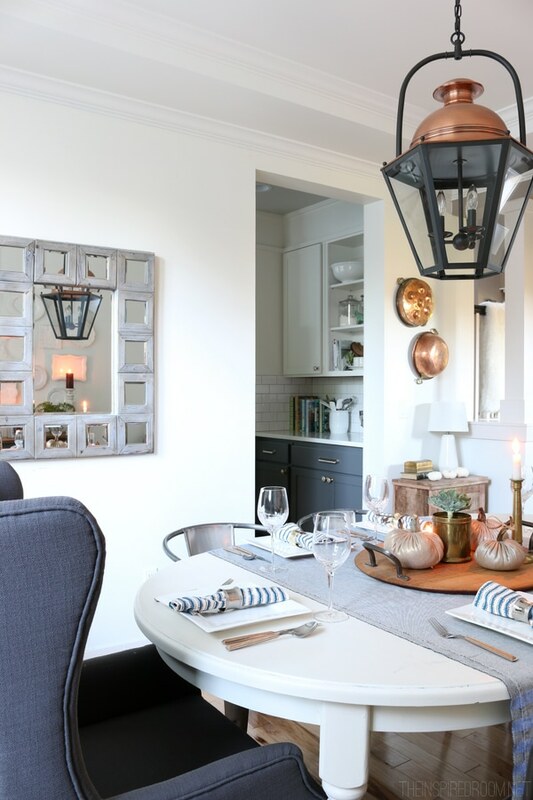 I love, love, love that clock and the mirror over the mantel. Thanks for sharing your home and your heart! Your dogs are killing me. They’re so cute. As a girl from the other side of the sound, I love the beauty of this time of year before those gray, rainy days set in. Thanks for sharing your beautiful home. I love the collection of white plates in your dining room. I don’t see any plate hangers showing though. May I ask what plate hangers you used? So beautiful Melissa! I love all the touches of blue in your home. And those dogs are adorable!! Love your home and blog. Just found it recently. Would you mind telling me where you found your dining room curtains and your pillows in your bedroom? Love the mirror and the vase with leaves on mantle. The dogs are precious. Now I will have to check out all they back pages of your blog. 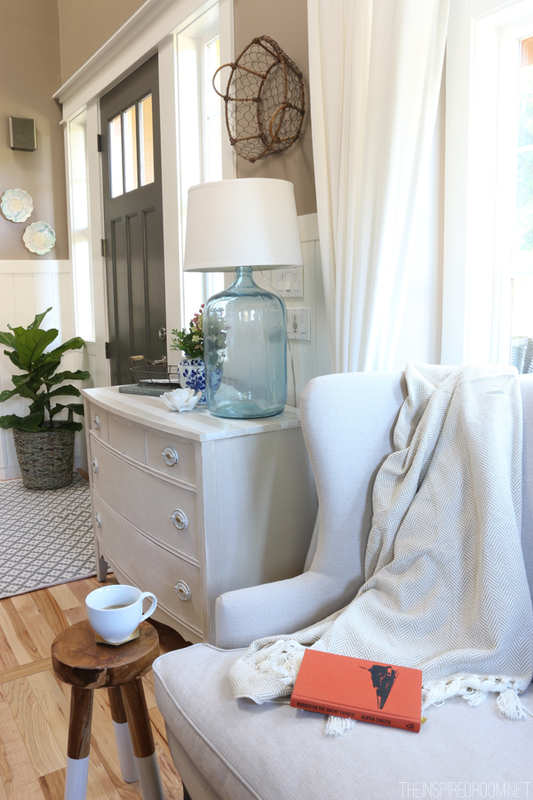 I especially love that you keep it simple…adding baskets, blankets, and candles. Those bread boards in the kitchen scream fall…perfect season for baking! My sister has a big, slobbery, wet-kiss giving Bulldog. Thanks for the warm and welcoming tour! I’ve got the same Nate Berkus Target lamp. Love the gold hex design. Here’s hoping for a Fall that stays gorge till October. Your home is stunning! 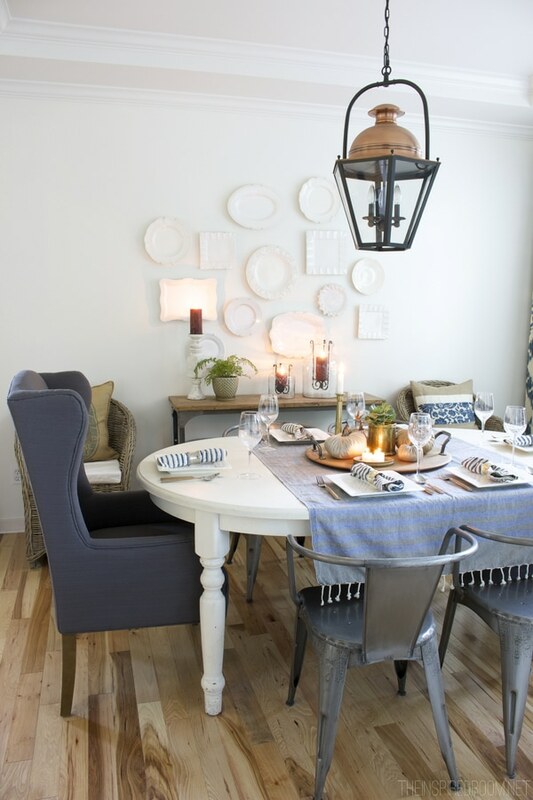 Love the simple fall touches you added and that plate wall is fabulous! Beautiful, beautiful, beautiful! You did an amazing decorating job in every space of your home. I am totally in love with the various colors of blue. 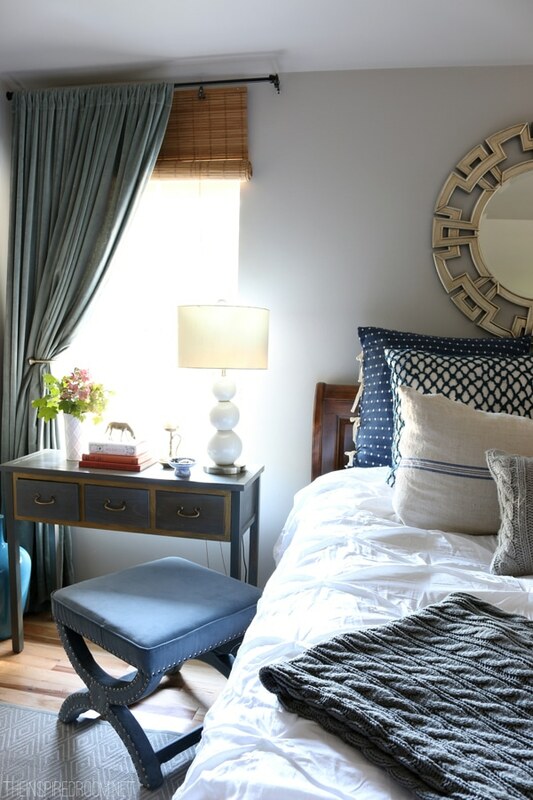 I have began incorporating the different shades of blue into my home and I am loving it! I never thought that I would have a blue home but now I think that blue is my forever and ever color for my home. Thanks for sharing Melissa! 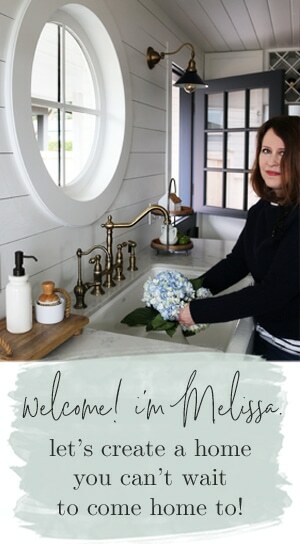 Melissa…..I enjoyed your fall home tour so much. Your fur babies are precious and remind me a bit of our labradoodle, kennedy. She goes nuts when we have visitors. We keep hoping that it is just a puppy phase, but she really isn’t a puppy any longer. I loved seeing each of your rooms, but your cozy media room is my absolute favorite. That blue sectional is to die for. Would you mind to share the color on the walls? (I loved on your paint colors page but couldn’t find it!! Thanks so much for the lovely tour! I am inspired! So lovely. I am too too envious of your fall weather and being cooler most of the year rather than Hot and Humid! 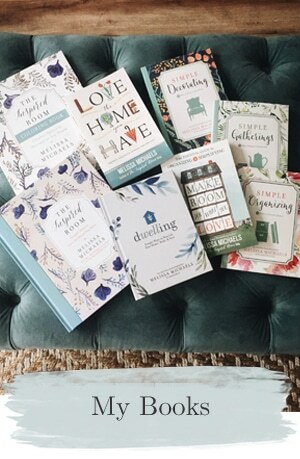 It’s obvious why your blog is such a favourite – your writing makes me feel like we’re just having a chat and your home is everyone’s Inspiration! love the basket at the entry on the wall. Can you tell me where to find cute decor items like this? Thanks, Lisa! I don’t remember exactly where I got it, I’ve had it for awhile, but try World Market or TJ Maxx/HomeGoods! They often have good deals on baskets and other cute decor pieces like that! I really really hope you see this! Where is the table runner from? It is so wide, and lays so nice! I have a similar table, and the same chairs! Hi Stephanie! The runner is actually a turkish towel. I’ve been meaning to do a post about that but this reminds me that I need to! :) I got it at a flea market but you can find them online! Where did you get your comforter/duvet from? I have been in the market for one for a long time now. Melissa, I love your home. 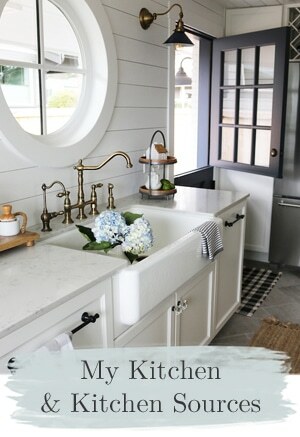 It was so cool to see your kitchen featured in BHG!! I was wondering where you got the nailhead gray chair next to the fireplace and where you got the dark gray captain chairs in your dining room? Have a wonderful night! The gushing could go on endlessly.. What a gorgeous home! I absolutely LOVE the mirror on your mantle and dining room curtains. Would you be willing to share where you found these gems? Your home is beautiful and I love your style! Did you ever post photos of the rest if your media room after putting the TV in? I’m redoing our bonus room which is odd shaped and am looking for ideas. I would love to see your whole room layout in one picture. I came across the photo of your TV/media room on pinterest; it looks wonderful! Would you mind sharing the name of the color and brand of the wall paint? Hi! Love your house! 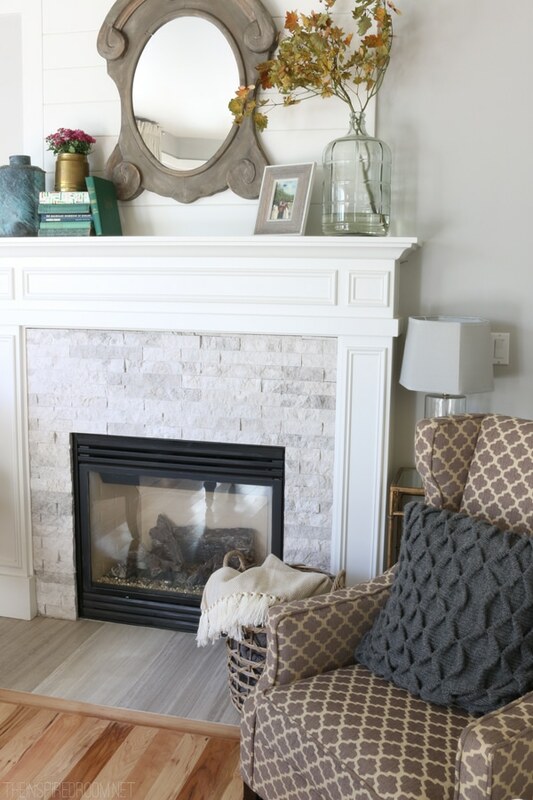 What is the stone around your fireplace? I’m redoing mine and love yours! Can you tell me the stone around your fireplace? I love it! I LOVE your flooring – what kind is it? Beautiful home and pups! Your home is so warm and inviting! I especially love your dining room. 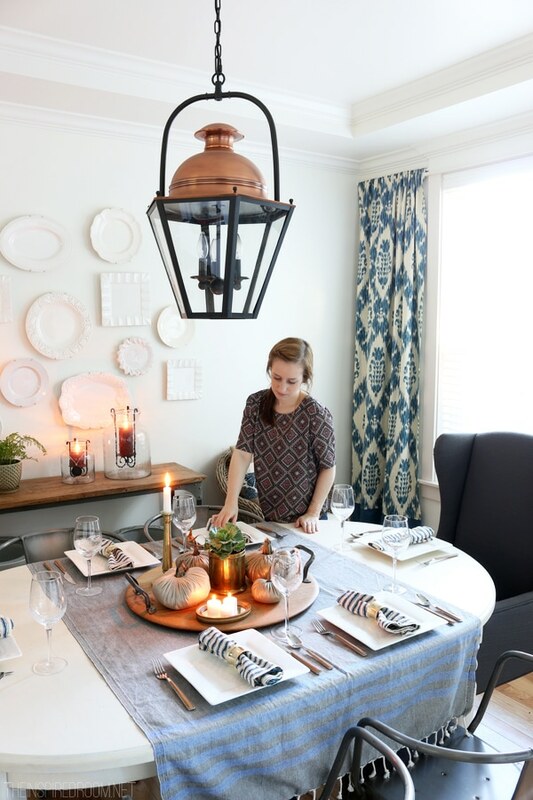 Could you please tell me where you purchased the striped table cloth/runner? Beautiful home! What is the paint color on the wall in your media/tv room? 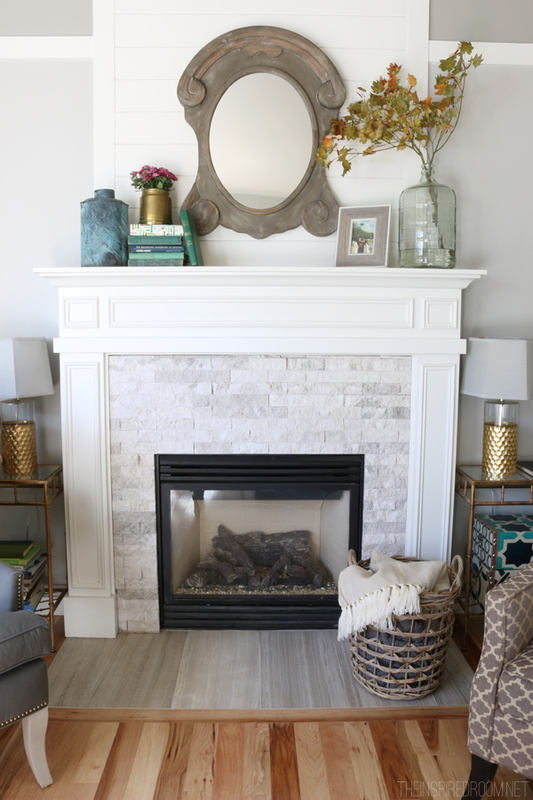 I want to emulate your fireplace – we are probably getting a gas fireplace installed that’s very similar. 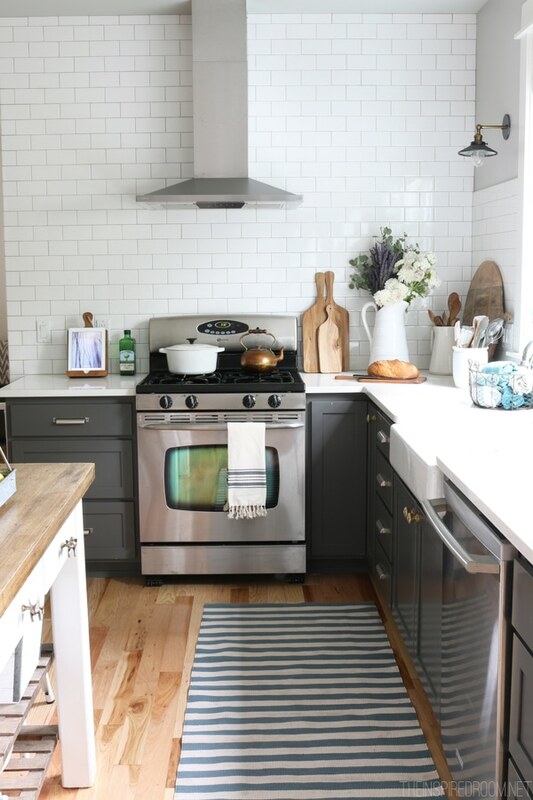 is that white brick with a wooden hearth? What is the hearth made of? Hello from Lake Stevens, WA! We just purchased a NW Contemporary home with lots of cedar….I LOVE your style. Do you do consulting or design help? So Pretty, Love the stripes! It caught my eye because I’m now searching for the right gray paint for my walls, what looked right in the store is too dark. Do you mind sharing your colors? Thank you!